Here, Mr Hotfoot. The hot-footing devil of the Black Country. 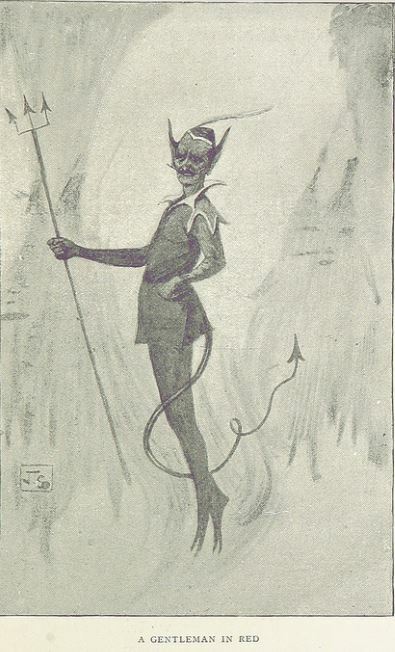 The story of the Devil rambling around snowy Devon in February of 1855 is a classic of Fortean mystery. You know the tale: a cloven-hooved biped walked over roofs and jumped haystacks in impossible ways, covering large sections of country in an improbably short time in a sort of paranormal parkour. A variety of theories have been proposed to account for these prints: from badgers and toads to gypsies on stilts and anti-clerical pranksters, but the mystery remains unsolved. You’ll find an exhaustive list of sightings, sources, and theories compiled by the incomparably thorough Mike Dash in “The Devil’s Hoofmarks: Source Material on the Great Devon Mystery of 1855,” in Fortean Studies, 1994. Vol. 1, beginning on page 71. Recently I ran across another set of mystery footprints attributed to the Devil, in, appropriately, the Black Country region of the West Midlands, an area noted for its collieries, foundries, and dark Satanic mills. A London paper says that a singular phenomenon has for some time existed in the parish of Rowley Regis, which has not only given rise to the most absurd rumors, but has been a source of wonder, and still remains an inexplicable puzzle to all the cunning men and philosophers of the locality. More than five years ago, in a small meadow occupied by Messrs. Mills & Co., at the Eagle Colliery, and through which is a footpath to the house of Mr. John G. Higgs, the check bailiff at the wharf, one morning were discovered a number of marks across the greensward, from the path to the boundary fence, and back again in a triangular form. These marks were nearly in the form of an immense misshapen human foot, and not only was every trace of vegetation destroyed, but the very turf appeared as if scorched with red hot iron. Numbers of people were attracted to the spot daily, and as the report spread, it was visited by thousands, and damage to a considerable amount was done, particularly on Sundays. The affair went on, and, after the lapse of a year or two, a strong thorn fence was thrown round, in the expectation that of course grass would again grow over the spots, where the common belief now is that his Infernal Majesty, for some purpose unknown to mortals, had imprinted the marks of his feet, but all has been to no purpose; not a single blade of any description of vegetation has ever yet appeared on the enchanted spots, and though the fence has been since removed, and the field regularly mown, the baneful influence still remains, and there the deep indented marks are, hard, dry, and barren as at first, a memorial of some mysterious agency; but ‘what it was no human ingenuity has yet discovered. It has been rumored that a gentleman residing near has affirmed he would gladly give half his fortune to have this disagreeable mystery satisfactorily explained. This article appeared under the heading “The ‘DEVIL’S FOOTMARKS’ In Staffordshire,” citing the Birmingham Journal in The Guardian [London] 2 November 1850: p. 5. In the United States, the article appeared in National Aegis [Worcester MA] 4 December 1850: p. 1 and Green-Mountain Freeman [Montpelier VT] 23 January 1851: p. 1—the identical story was repeated in that paper on 6 July 1854: p. 4—as well as several other US publications. The article is not very helpful as to the actual date of the fiery footprints: “more than five years ago,” suggests the early 1840s, but it might be even earlier. A website about the area’s history, “Black Country Muse” mentions John G. Higgs as one of the managers of The Five Ways/Whitehall Colliery in 1844. He is also described as having sunk the pit for the Eagle Colliery in “the 1840s” and living at Totnall House, Powke Hill. The Black Country Muse site adds that “Elizabeth Brown, another one from the licenced trade, said she had seen the same marks burnt into the rocks at a quarry on the Rowley Hills, and they all led to the Hailstones.” These standing stones, which no longer exist, were said to have been a Druid place of sacrifice. And we all know what the Devil gets up to in places of pagan sacrifice…. My fertile imagination created a prankster ironworker (a die-maker?) who forged a pair of immense misshapen feet, heated them white hot, then walked these monstrous branding irons around the greensward, bringing the metal feet out of retirement a few years later to sear footprints onto quarry rocks for an additional fillip. This is, of course, only a wild theory, but perhaps no wilder than the notion of his Infernal Majesty hot-footing it around Rowley Regis. If we wish to be all sensible and scientific, we might consider the earth-scorching possibilities of toxic gas vents, local air pollution, or hot spots from a smouldering coal seam. Mr. Higgs and one of his neighbors sank pits within sight of their own houses. But a Satanic tool-and-die man is better theatre. Is it possible for intense heat from red hot metal to sterilize the ground and leave it barren for years?